For 63 years, St. Andrew’s Lutheran Church has been serving Christ from its place on Crompond Road. We are a community of believers who gather around the Word and Sacraments and seeking to be together for fellowship, education, and service. The people of St. Andrew’s want their church to be a welcoming place for people of all ages and backgrounds. Centering on the Grace of our Lord Jesus Christ, we seek to live in love; expressing forgiveness, joy, acceptance, and praise, while serving the needs of others. We invite you to experience the Spirit of God and the spirit of the people of St. Andrew’s. Come to worship. Stay for refreshment. Bring your child to Sunday school. Stop by and visit with the Pastor. We are here for you. On Sunday, September 25, 1955, a Lutheran church service held at the Grange Hall in Yorktown Heights, New York was attended by 215 people. Less than a year later, in April of 1956, 142 charter members came together to formally organize a congregation. Holding its first few services in a farmhouse with the Rev. Paul Riss serving as pastor, St. Andrew’s Lutheran Church was born. In December of the following year, our second pastor, Rev. Walter P. Scherr was installed. 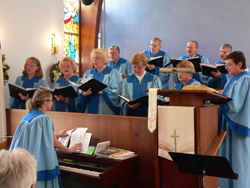 The new congregation grew quickly and in little over a decade things changed significantly. Worship services were moved into a newly built sanctuary, and the addition of Sunday school rooms, a nursery, and offices soon followed. In 1968, the congregation participated for the first time in a cooperative Vacation Bible School with the neighboring Methodist and Presbyterian churches, a program that successfully continues today. Not long after, in November of that year, Rev. Malcolm A. Lurch became the third pastor of St. Andrew’s. In 1977, the church’s fourth pastor, Rev. Robert E. Johnson, began a call that would last almost 30 years. The Johnson family was the first to live in the newly-built parsonage. In 1986, the now thirty-year-old congregation found itself in need of more space and dedicated a new fellowship room, pastor’s office, main office, and kitchen. The next two decades were filled with many events that the congregation, led by the Holy Spirit, shared as a family. We saw two hymnals, the Lutheran Book of Worship and With One Voice come and go, and we welcomed the installation of our first Deacon, Tom Farrell. During this time many outreach initiatives were started including the serving of meals at Jan Peek House and our participation in the ecumenical Thanksgiving service. We began sharing our blessings with our sister church, All Saints Lutheran in the Bronx, as well as the Kibeta School in Tanzania, and we tithed significantly for the Synod’s Jubilee. In 2008, St. Andrew’s began a new and exciting chapter in its storied history with the installation of Rev. Paul T. Johnsen. With Pastor Johnsen, the love of God, and guidance of the Holy Spirit, our church family experienced the joys of ever-increasing ministry, faith, and fellowship. Among his lasting contributions are ministries with youth, women and men. Pastor Johnsen retired the end of July 2016. In October 2016, Pastor Arden Strasser came to St. Andrew’s to inspire and walk with us on our faith journey while we searched for and waited to call a permanent pastor to our congregation. Pastor Dave Dockweiler answered the call to become St. Andrew’s new pastor beginning in September 2017. Pastor Dave comes to us from the North/West Lower Michigan Synod and has had experience as a senior pastor and associate pastor. He also was a youth minister in Ohio and has extensive experience working with young Lutherans. We are looking forward to Pastor Dave helping us to grow as Christians and to carry on God’s mission in the world.